In Coventry on the A46 southbound at the A428 roundabout there are three arrows marked straight on, the outside lane (ringed in red) changes to right only (ringed in white) halfway round and drivers in lane 3, who thought they could to go straight on, cut back across traffic to get into lane 2 to get back on A46 (blue arrow). 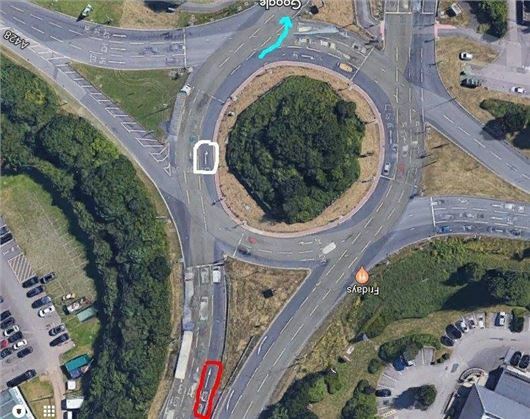 I have been cut up several times on this roundabout and I have now done a bit of a poll on local Facebook and several drivers agree that they are regularly cut up at this roundabout. Highways England has come back with that UK traffic signs manual states: “8.31 Right turn arrows are best avoided on the approach lanes to a roundabout, other than a mini-roundabout, particularly as they can mislead overseas drivers used to driving on the right who might turn right into oncoming traffic on the roundabout. Where a right hand lane is dedicated to a specific destination, this should be associated with an ahead arrow until the vehicle is in the circulatory carriageway.” This law seems to be stupid, showing straight on arrows for a lane if that lane cannot continue 'straight on' safely. What do you think? Point well made. I have been caught out by this on the first roundabout on the northbound turn from the M1 to the A421. I get into lane 3 intending to go straight on. But the articulated truck in lane 2 wanted to turn right and needed the space. I accept I was in the wrong. Really, three lanes approaching a roundabout should be treated Lane 1: left turn at the first exit; lane 2: straight on at the 2nd exit; lane 3 3rd exit or continue around the roundabout. A bit of common sense overcomes poor lane marking even though I had to be reminded by the rude blast of an HGV horn and saved the day by circulating completely round the roundabout. That’s something a lot of people don’t have the common sense to do. If they miss their exit, go round again. Don’t stop and cut across everyone else’s path. I know I'm a grumpy old man and I've written to you before about walk through vehicles. I appreciate not all drivers like or want an automatic 'box. I know you don't like an electronic handbrake. Several upper echelon marques have the auto control no more than a knob for control. It is now an offence to drink or eat at the wheel, so there is no longer a reason to have an midline structure for drinks holders, gear shift and handbrake lever causing an obstruction to walk through. Why aren't there any more than the Citroen C4 Picasso auto with this facility? As diesels are getting unpopular, what are the South Korean makes going to do as all but their smallest models are diesels? I saw a Golf yesterday with LED rear lights. The turn indication was faulty with about 10 "bulblets" in 3 groups, either winking red instead of amber, or not at all. These developments I think are getting more common? Would what I have described be an MoT failure and I dread to think the cost of replacement as compared with a simple old fashioned bulb change? When Honda stopped making walk-through Civics and CR-Vs in the 2000s I took it up with them. Their answer was that customers want a 'console' to put things in: usually keys and mobile phones, so they bowed to public pressure and ceased making their cars walk-through. The South Koreans are advanced with hydrogen-powered cars, have produced LPG hybrids, and are about to launch some bigger diesel hybrids. The Optima, Niro, Ioniq and Soul are all available as hybrids, some as plug-in hybrids, some as electric. Yes, that rear light will now be an MoT failure. Carmakers are making things increasingly complicated to no real end apart from disposability that will force owners to replace their cars earlier and keep the production lines churning them out. But if you think the rear indicator you saw is dodgy, take a look at a few VW Golf Mk IV rear indicators. The amber bit is in the middle of the red bit and with age is very difficult to see. I've just bought a new Golf Mk 7 1.5 EVO Nav DSG (petrol). I was surprised to find that VW emphasise the Bluemotion aspects of the car that now includes stopping the engine completely under certain conditions when moving. I find it very disconcerting to have the sound of the starter motor restart the engine while the car is in motion. This facility can be turned off using the stop-start control button. When the engine is stopped the electrical systems are powered by a Li-on battery pack under the passenger seat. This is in addition to stopping two of the cylinders working at times of light engine load. Has VW gone too far and made the car too complicated with yet more systems to go wrong? Incidentally, neither the dealer or the product sales literature made any mention of this additional system when I was ordering the vehicle, and the dealer had no idea what the black box was when I collected the car. If I had known I might about this system I might not have gone ahead with the purchase. How can I find out which type of DSG gearbox is fitted? As far as I know (because I have not been given any information to the contrary) it still has the DQ200 7-speed dry clutch DSG but an improved version. There have been some rumours of problems with the engine but what I have received is 2nd hand so not confirmed and I have not got to the bottom of it yet. I have driven the 1.5TSI briefly and found it to be extraordinarily refined for a four-cylinder engine, marred only by tyre noise from the low profile tyres on the car. Can you recommend a small 5-door hatchback that, with the back seats down, provides a continuous platform to the tailgate (no gap)? I’m a 76-yr-old widow living alone and need to transport things like bags of compost from the garden centre, rubbish to the tip and luggage to/from the station, and slide them in and out easily. I currently drive a Suzuki Splash, successor to the Wagon R, as it fulfils the above as well as having a high driving position and excellent rear visibility, but it’s getting old. Nearly all my driving is local, much of it on single-track roads. Your advice and suggestions would be greatly appreciated. My 2010 VW Polo 1.4 DSG experiences sudden power loss. It has been regularly serviced by VW. I was told by the VW dealership it’s the Mechatronics module that has gone and was quoted £1,700. I said that was a lot and VW told me the VW dealer would take £300 off the bill. After checking with two independent car repair garages they said this was quite a common fault. I have taken some legal advice and am considering going to court. The way the car lost power from around 30mph to 5mph I think is a safety issue. Also if it’s a common fault, should there not have been a recall for this? Are you aware of anyone going to court over this failure of the Mechatronics? I am aware that if I could win the case and get VW to pay it would cost me over £1,800 in legal fees and yet the work would be £1,700 and the legal costs cannot be reclaimed because legal fees are not awarded for cases under £10,000 in the Small Claims Court. However, I would look at making the Small Claims myself as a relative of mine is a solicitor. You might say people have gone to court on this and lost / or not gone to court? Are you aware of anyone going to court over this issue? I recognise most people simply want to get their car repaired as soon as possible and probably once they realise a solicitor costs more than the repair they drop it. But there is a point of principle here and the lack of a recall / safety issue. My wife has a 4-year old Vauxhall Corsa. We bought it second hand from our local dealer, Bristol Street Motors – Durham, when it was 3 years old. The car now has about 24,000 miles on the clock. The drivers seat covering has started to crack over the last year in several places (see picture). I took it to the dealer and registered the issue with Vauxhall customer service centre directly. I have been told it is no longer covered by warranty and will not be replaced, but actually my issue is that the material or assembly must be faulty as this is a very low mileage car that has been looked after. I also visited a specialist upholsterer to be told that what Vauxhall (and others) are selling as ‘half leather’ is actually a vinyl covering, prone to cracking and that they see this all the time. I’m frustrated as the car cannot easily be traded in, if we were to keep it, it looks more like a classic car with well-worn seats. Can you offer any advice / help on this one? Vauxhall will not 'cover' this under its 'lifetime' warranty so your only option is to have the seats re-covered by a local 'car upholsterer and trimmer' (http://www.yell.com). We will record the problem in the carbycar entry. I have a 2014 Skoda Octavia 1.4TSI with a DQ200 DSG. I have read your comments on this many times, none of them complimentary. In 4 years I have not had a problem, so I am really curious to know if you know how many gearboxes of this type were installed in VW group vehicles and how many units have failed in use World wide. I would appreciate if you could give your readers and myself fact-based information and hopefully not generalised garage or limited survey information. I ask because most people reading your comments would either wish to get rid of their vehicles or get together with other owners in a class action against VW for installing a faulty product in their vehicles, or do you know in your many investigations of such an action already proceeding. All I can refer you to are the huge number of complaints received in http://www.honestjohn.co.uk/carbycar / This is the fairest way of recording problems because they are only ever listed when individually and directly reported to us, and all manufacturers are treated equally. Even though numbers of complains have to be set against numbers sold I obviously cannot recommend anything subject to so many complaints or readers would complain about that. I do not subscribe to quantitative research based on questionnaires because they can easily be skewed by self-interest. In other countries such as the USA, Canada, China and Australia action by government departments has forced VAG to extend the warranties on DQ200 DSGs to 5 years, just as they have forced Ford to do the same for dry clutch Powershifts. Some lawyers working on UK class actions are listed in the carbycar entries, but we will not get involved with them. I am thinking of buying a used, convertible, Mazda MX-5. Could you please remind me of the best model to look for? I'd go for the 2.0 litre 6-speed Sport with limited slip diff from 2005-2015: /carbycar/mazda/mx5-2005/ Or, if you want an electric folding hard-top the 2.0 litre 6-speed MX-5 RC from 2006 - 2015: /carbycar/mazda/mx5-roadster-coupe-2006/ But remember, there's very little room inside and anyone over 5 foot 9 can be uncomfortable. I was fed up paying for vehicles all the time through finance with nothing to show for it at the end on PCP deals, so decided the best way forward was to lease a vehicle. We opted for a MINI Countryman 2.0 litre Cooper S. We were delighted at the low cost per month and low deposit. The car was delivered on Tuesday 10th April by a distant BMW dealer on a delivery truck. I was away at the time working so was unable to take delivery. My wife received the car in the pouring rain (I’m not kidding) and had to sign the ‘no damage’ form. I washed the car on Saturday 10th April and noticed what I thought was overspray on every alloy wheel and reported this fault to the leasing company. Their immediate response was “not our problem, you signed the paperwork, however we will pass this on to the dealer.” The dealer called us, then required us to take the car to a local BMW garage for inspection. The ‘technician’ deemed that the wheels were damaged by tie-down straps rubbing away the alloy top coat down to metal, most likely caused by delivery. The report was relayed back to the supplying dealer who asked for a quote to put right. The local wheel specialist quoted £300 for a full refurb. The supplying dealer, clearly not happy, has stated he would get back in touch with a solution to this but nothing has happened. I have emails back and forth (mostly forth). The only response I have had is a ‘goodwill’ gesture of £100 after a lot of chasing and slating on social media. The reviews online of the customer service are abysmal. I have passed this back to the leasing company to pursue. However they state their hands are tied. Any suggestions welcomed. I was thinking Small Claims for the £300 but not sure where to start with this as you Google them and millions of companies pop up . You don't own the car. The leasing company does. So the dispute is between the leasing company and whoever delivered the car to you. Just make sure you keep hard copies of all your email correspondence and I suggest you send a letter by Post Office Special Delivery to the leasing company reporting the damage on delivery and stating that because it occurred before the car was actually delivered it is not your responsibility at all and you will not be held liable for it either now or at any time in the future. Keep a copy and staple the Certificate of Posting to the copy (together with your other hard copies) so it becomes a Matter of Record if the leasing company tries to hold you accountable for the damage. The correct link to Small Claims is https://www.gov.uk/make-court-claim-for-money , but this is not relevant to you because you do not own the car. I have very serious concerns regarding the “Assisted Driving Plus” facility that I specified on the BMW X3 that I took delivery of on 1st April 2018. One of the prime reasons for exchanging my previous 3 year old X3 was to take advantage of all the latest technology that was purported to be available on the latest model. However, I believe I may well have a case under the Trade Descriptions Act for a refund of the amount I paid for the facility in question as it clearly is not performing to the specification as set out in the owners handbook or promotional material. I will set out as follows (as briefly as I can) the various functions that in my opinion are not meeting this specification. The Steering and Lane Control Assistant causes me serious concern as I believe it to be inherently dangerous. I have persevered with the system but after numerous occasions when I have had to rapidly override the system from steering the car far to close to both the near side of the road and to vehicles being passed (on a dual carriageway) I no longer use it or will do so in the future. In addition, when active, even on a straight stretch of road, the cars passage will be far more erratic than without it on with a tendency to weave along the road. I would also add that far from being an aid the fact that one constantly has to keep an eye on both the road ahead and the display in the instrument panel to check that the system is still active simply adds to the overall driving load. My views are supported by a recent report on television that you may have heard about from Thatcham. I saw the report that raised serious issues about driver assistance systems and focused on both a Tesla and a BMW. The report showed a BMW on a 3 lane test track with the car in driver assistance mode suddenly and without warning veering from the outside lane across to the near side lane. Next point, I quote from the handbook. “The Persons Warning system warns of the possible risk of collision with pedestrians in the urban speed range and provides assistance with braking function. Persons are taken into account if they are located within the detection range of the system.” There is then an illustration of the detection range in front of the vehicle showing the “central zone” and the “extended zone” being either side of the road. The system has never activated even when approaching pedestrians crossing a zebra crossing or traffic light controlled crossing. On numerous occasions I have monitored that I am approaching these crossings at more than the 3 mph necessary to activate the system. If the system is limited to only activating when within a few yards of a pedestrian it would seem a little late to take avoiding action, so what’s the point in it? Whilst when reversing slowly the Cross Traffic Warning system does give an appropriate warning, when moving forward to turn out onto a road with the system activated with either the PDC or Panorama view turned on as per the instructions in the handbook, on the very rare occasions that a warning has been given the approaching vehicle is so close as to make the warning pointless. The Cross Traffic Warning is also covered under “Front End Collision Warning” where it states that “an additional warning is given at junctions and T-junctions if there is a risk of collision with crossing traffic. It goes on: “Junction Warnings: vehicles that cross the vehicle’s direction of travel can also be detected by the system as soon as these vehicles enter the detection range of the system. No such warning has ever been given under these circumstances. The same system is also meant to provide a warning of any possible risk of collision with a vehicle in front. I have never been warned of the close proximity of a vehicle in front of my car and whilst I do always leave a safe distance there are times when one is of course following a closely at slow speed and the system is quoted as providing a warning from approximately 3 mph. One would think that perhaps the various detection systems are at fault but the dealer recently had the car for 2 days when a senior technician went through everything and reported that all systems were operational. So what is the problem? If BMW maintain that the system is working within its parimeters then I have wasted some £1,600 on the system and will have to seek advice as to whether the position calls for action under the Trade Description Act. The shame of all this is that to drive it is a really great car and by far the best of the X3s that I have owned. I would also add that I have been a fervent supported of BMW for many years changing my car regularly. I really enjoy driving and clock up many miles travelling between our homes in Fleet and Devon. This is the first time that I have ever had any problem with a new BMW so all rather disappointing. Cracking little car - having personally worked in this area I think it's a scandal that many vehicles sold with leather seats actually have very little animal hide - usually only the sections in contact with the user, the rest, eg side and rear panels, are actually textured PVC made to look and smell like leather. This happens even on luxury/upmarket vehicles. Achieving Autonomy - I think the correspondent may have the wrong impression of the driver assistance systems fitted to their BMW. I see that the report from Thatcham published recently stated the marketing of the systems is at fault. I have no experience of BMW systems, but have driven a number of Infiniti Q30s fitted with the Mercedes forward collision mitigation system, which has a red warning light that illuminates if the system calculates you are following too closely. It waits about 5 seconds before it illuminates. I have never been in a situation where the forward collision warning or the autonomous braking has activated . I own a Honda Civic with the Honda sensing systems fitted, and like all these systems everything is a driver aid - for example with the lane keeping assist system you have to keep your hands on the steering wheel, and I find it a useful aid on a long motorway journey. You still have to keep your hands on the steering wheel, and it is an aid to keeping you in the lane. For the forward collision mitigation system the key is always whether the system judges there is a risk of a collision. If you are going the same speed as the car in front there is no risk of a collision. If the car in front slows and the speed differential is sufficient the Honda system first flashes a yellow warning light, then beeps and finally if you do nothing it will brake. I have had the warning light come up on a few occasions when a car in front has suddenly slowed, and on one occasion the warning beep when a car slowed almost to a halt approaching a speed hump and I was a bit slow to react. Again the risk of a collision comes from the sudden speed differential. Even if the road markings are obviously incorrect (and should be reported to the authorities), its blindingly obvious that the RH lane is for turn right 99 times out of a hundred, as in this case the straight on road only has two lanes, thus those in the RH lane nearest to the inside of the roundabout will have nowhere to go - anyone turning right should be filtering across to the middle lane as they are passing the exit before. Some roundabouts have the road lane markings on the roundabouts that automatically do this (e.g. the inner ring road/Newmarket Rd roundabout in Cambridge near me as per the below link), but they can be confusing to people 'used' to the 'standard' markings and many people stay in the 'area' they get on the roundabout in, often cuasing just as many near misses as the OP did in this letter's incident. I think it's fair to say that most large roundabouts I have encountered have 'ambiguous' road markings, though of course I am aware of the problems on local junctions. Basically, you get in a lane marked for your destination, then after an exit that land changes. I can think of one local roundabout where the correct lane 'appears' half way around the circuit. As the correspondent notes, the problem is compounded by HGVs often needing a wide berth, quite possibly a vehicle longer than usual when the junction was created. I drove over this junction today and do so often. The problem is that the arrow is straight on but the road markings say A428 COV. In short, they conflict and defy common sense as A428 COV is a right turn at the roundabout, so the straight on arrow is misleading and lulls the unwary into an error. Highways Agency is wrong and ideally if arrow pointed right, it would cut problems. Most roundabouts could be better laid out by a 5 year old. In Telford, the highways authorities have spent millions of ££ recently 'upgrading' a significant number of major roundabouts in the town; some traffic light controlled and others as standard roundabouts. Without exception, the white lining indicator lanes and markings are confusing at best and downright misleading at worst, leading to any number of near misses. On one, located at J.4 of the M54, Highways have been back to change the laneage twice since completion, and on each occasion have left it even more confusing and ill thought out than the original. It would almost make more sense to abandon all the markings altogether and impose a shared safety zone and let everyone make their own minds up ! I don't know why people like cars with massive centre consoles. 2) If you have to lower the seat (to get headroom and sight lines) the "armrest" on the centre console does not drop with the seat so you end up like Quasimodo with you left shoulder hoisted up in the air. Presumably marketeers think it makes their cars look luxurious; it just makes them impractical / uncomfortable for many potential customers.